Lately I find myself buying potatoes for more reasons than just a dinner side. Turns out they have a lot more beauty benefits than you may think! If you have a deep pimple, dark under-eye circles, acne scars, fine lines, discoloration or even a stye a potato just might spare you some embarrassment. 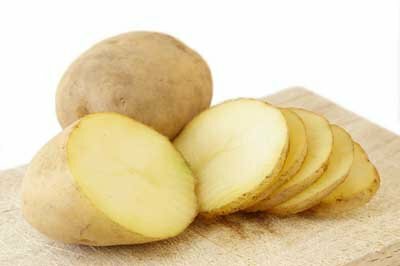 Not only do potatoes contain acids that help fight bacteria, they have a ton of vitamins and enzymes that help lighten skin, reduce the size of your pores, and eliminate inflammation. Potatoes also stay hotter longer than a wash cloth when heated which helps unclog pores as well (warm compress treatment). Thanks for dropping a note! 🙂 I’ve heard good things about tea for the face, and I’m a huge fan of Aloe myself… Especially after I get a face peel or sunburn. But I’m definitely going to comment and subscribe to your blog – I’ve been wanting to learn more recipes and get into cooking lately! Food plays a HUGE role in my beauty regime lol because I am a fruitarian. I cleaned myself from the inside out. I have not tried the potato method before, but I’ve tried almost every other natural remedy and unnatural remedy (medicine). But now, I don’t even need to try to potato method because my skin is finally clear, super healthy, and radiant. A few years ago, I had TONS of acne and even bacne!! Eww.. Here is my blog if you are interested in reading what I did over the span of 6 years to have clear, beautiful skin 🙂 I included a “before” and “after” picture. Happy Healing & Blessings on your journey!